Late last week I was sad to hear of the passing of Patrick Walsh, the City of Houston's Planning and Development Director. Pat, as he was better known, had been on leave since being diagnosed with a brain tumor earlier this spring. He died on Friday, November 23rd, reportedly peacefully, and surrounded by his family. It's been a few months since I left the City of Houston, but I've managed to stay in touch with many colleagues, and never got the impression Pat's diagnosis was terminal, or this quickly terminal. It's all a bit of a shock, especially because of the energy and vitality that Pat brought to the office, and to life in general. Nonetheless, Pat's passing is a tremendous loss for the City of Houston. His leadership helped bring a number of new programs and disciplines to the Planning and Development Department and fostered increasing coordination between departments, especially with the Public Works and Engineering Department. Pat's background in civil engineering made that possible. In a city that has generally shunned more coordinated planning efforts, Pat did a tremendous amount to change that course. Houston's future will be better for all of his efforts. Pat certainly got more than he probably originally bargained for, originally being hired as an assistant director, when, only a few days later, the Planning and Development Director at the time announced their resignation. Pat was promoted to Interim Director, then appointed by Mayor Annise Parker and the Houston City Council in 2014. I certainly didn't have a close personal relationship with Pat, but as an employee of the Planning and Development Department, his influence was undeniable. I've written a few thoughts to help remember Pat's influence. Pat's leadership in the department translated into an immediate boost in employee morale. He was steadfast in providing increased department communication and employee appreciation. Every year, Pat and his wife hosted department employees and their families around the holidays, opening their home for a few hours, and providing a welcomed time for employees to get to enjoy each other outside the workplace. He certainly fostered a family atmosphere, something for which I was continually thankful. One of Pat's first big responsibilities was leading the process of Plan Houston, Houston's first general plan. Pat also led the efforts behind other initiatives like the Houston Bike Plan, the Walkable Places Committee, and other efforts, like those to allow a decrease in parking minimums in certain parts of the city. Pat also provided support for Mayor Turner's memorable speech before the Texas Transportation Commission, calling for a paradigm change in transportation in Texas. Before working for the City of Houston, Pat led the Paws on Patios campaign, which effectively worked to allow dogs in outdoor dining areas within the city. Without question, the hardest part of Pat's passing is the growing family he left behind. He became a father in early 2017, and it was a joy to see him share that process with colleagues. I was normally in the office just before 8AM, and would regularly run into Pat in the break room while he was getting his coffee. As a recent father myself at the time, it was fun to ask how fatherhood was progressing, and pass along anything I had been learning at the time. His accessibility provided a climate of learning and dialogue, especially for us less-seasoned staff to be able to share ideas, whether about our department, or about development in general. Of all my interactions with Pat, the most memorable came through the work of our department in the Complete Communities initiative. This is Mayor Sylvester Turner's hallmark program for neighborhood improvement in Houston. Having provided leadership for one of the neighborhoods in the program's initial round of the program, I was part of a group that regularly met to provide updates on our progress to the mayor. It was fun to see Pat prepare and work his way through the briefings. It was certainly no easy task for him, providing updates and asking for feedback from Mayor Turner. I appreciated Pat's willingness during the process to consult with us as employees, even those with a bit less experience. 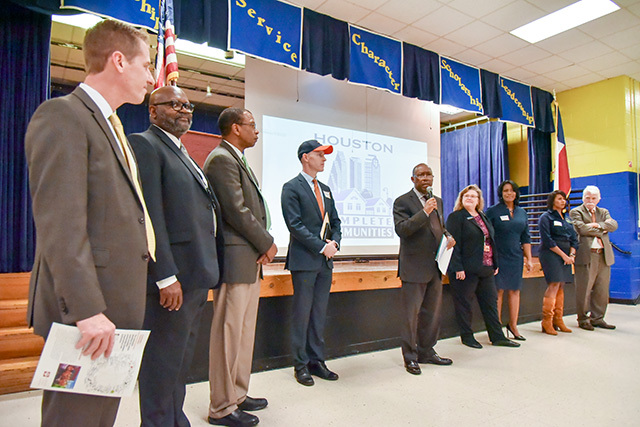 My work in Houston's Near Northside neighborhood included a community kick off meeting which was scheduled on November 2, 2017, a day after the Houston Astros won the 2017 World Series. With everyone in Houston (especially in the year of Hurricane Harvey) excited about the big win, Pat wore an Astros hat to do his introduction for our meeting. It's one of the small things I'll remember about Pat, but it's something that was so emblematic of his approach to his job, and his joy for life and his hometown. It's something that made him approachable and relateable, especially as a department director for one of our countries largest cities. My last interaction with Pat as an employee in the Planning and Development Department was my exit interview in March of this year. With a busy schedule and a lot of other things to consider, Pat took about an hour of time to meet with me. Instead of sitting in his office or a conference room, Pat insisted on taking a walk through Downtown Houston. That was his style, and is something I greatly appreciated. I enjoyed being able to have that time to talk about my experience in Houston, why I decided to pursue a different opportunity, and where I could see the department grow as an employee. Pat was intent on learning how to continuously improve the department, especially for its employees. We walked over to the Corner Bakery at Main and McKinney and each got bottle of milk and a huge chocolate cupcake. It will be an experience and exercise that I hope to carry as I continue my career. Pat's influence will certainly live on through many employees, and Houston's future will certainly be affected for the better because of his work.